Chorus has developed proprietary conversation intelligence technology for improving the actions that result from meetings and conference calls. The AI-powered Chorus platform helps sales, marketing and management teams make decisions using insights gathered from the conversations in every sales or customer success call. Chorus helps business leaders understand what influences conversation outcomes. Chorus is AI-driven conversation intelligence software designed to help sales teams and leaders gather insights from the thousands of conversations that happen during meetings and calls. 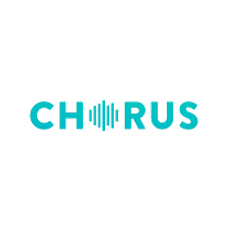 Chorus records and analyzes every conversation, learning what happens differently when deals are won compared with deals that are lost, and provides a guideline for future conversations. Smart transcripts highlight key mentions, and Chorus learns over time, providing objective data from conversations to guide feature prioritization, product messaging, and competitive positioning. From the Chorus App, sales teams can take call notes that are synced to their recordings, and published to Salesforce for easy follow up and smooth account hand-offs.